Strange things going on in Santa Barbara ... involving seals and sea lions being attacked by juvenile white sharks. To start with, the pinnipeds (seals and sea lions) are young themselves and underweight, which means they're undernourished. That translates to not having found enough to eat. On top of that, they're showing up wounded, with big bites from the jaws of smaller white sharks -- juveniles. Shark researchers are analyzing local conditions, trying to make sense of this. One expert reports that for two years the classic summer upwelling of ocean currents has not occurred. This upwelling brings large amounts of food with it -- nutrients of all forms, including small and large fish. As a result, all kinds of ocean animals -- including baby sharks, baby seals and sea lions -- are not getting the food they need. They are resorting to unusual behavior to nourish themselves. Young white sharks are attacking seals instead of fish, and seals are going hungry. Normally, juvenile white sharks don't try to hunt seals until they've grown to 9-10 feet in length. For a 6-foot shark to grab at a seal or sea lion is not normal. The Santa Barbara Marine Mammal Center (SBMMC) had to euthanize a yearling female sea lion with a gash in its back on September 9th. The 40-lb. 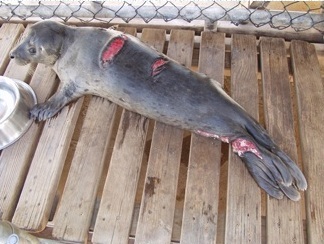 seal shown below was attacked in August (photo courtesy Shark Research Committee). "For juvenile white sharks to attack big seals is very unusual," shark expert Ralph Collier comments. The natural world's predator-prey relationships have been carved out of time itself. The survival instinct -- which in the animal world is pretty simple: growing to adulthood and participating in biological reproduction -- rules behavior. Says Collier: "When animals ignore their survival instincts, that tells you something is wrong." What could be the cause of the lack of upwelling? Is it natural, or is it man-made? Navy warfare-testing zones off our shores have been conducting many different kinds of experiments, involving use of explosives, electromagnetic frequencies and chemicals. The public has been informed that ocean animal species may suffer and die as a result. This is known as "taking" in the military's environmental language. It could be that these ongoing experiments (see our Navy Warfare Testing page for more) have affected currents, which in turn affect food supply. EIRs (environmental impact reports) were conveniently skipped as these programs were implemented and the window given for public response was very brief. Further observation is needed; please report your shark-related sightings to the Shark Research Committee. Update on White Shark Sightings: Monday, July 2nd at La Jolla Shores made the news. 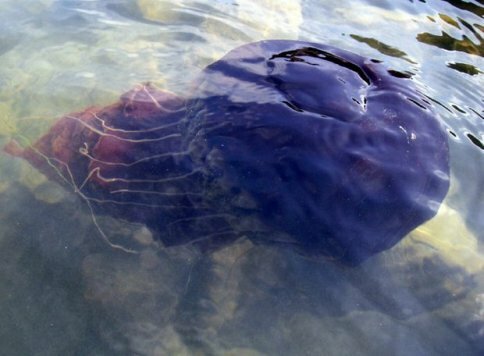 A 14-to-16-footer was seen underwater, close enough to shore to shut down nearby beaches including La Jolla Cove. Not officially reported was another sighting four days later (Friday): a surfer paddling north at Boneyards (Swami's, Encinitas) saw a 14-foot shark beneath him an hour before sunset. July 16th, Tuesday, brought a third sighting: lifeguards at Torrey Pines State Beach saw a 12-foot shark heading north just before 3 p.m. These would all be what are being code-named "jumbos" (great whites). So we do have some small adults roaming around, but none have actually done anything, not even taken a closer look at anyone! Remember that whites don't exist in great numbers, and remember the predator-prey relationship. Where the food (seal population) is, sharks go -- just like people: "refreshments offered" always brings them in!